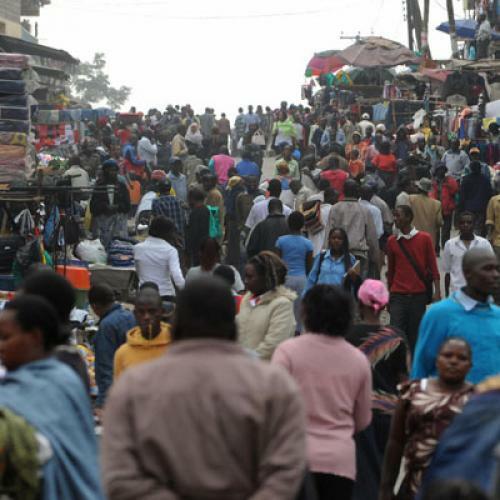 Is the U.N.'s view of population growth too rosy? Gaborone, the capital of Botswana, doesn't come up in the news very often. And why would it? There's no war or ethnic strife. The city is poor, but not outlandishly so--in fact, thanks to a stable government and a lucrative mining industry, Botswana is one of Africa's rare economic success stories. All the same, Gaborone has a problem: What was once a town of 17,000 people in the 1970s has ballooned into a city of 186,000 today, and is expected to swell to 500,000 by 2020--a staggering increase by any measure. On balance, growth has been a good thing: As people arrive from the countryside in search of work, Gaborone has been transformed from a dusty outpost into a bustling financial and industrial hub, with glass-and-steel buildings dotting the skyline. But city planners are now struggling to keep up with the torrid growth in population, which has led to out-of-control sprawl, soaring unemployment, a worsening AIDS epidemic, and the proliferation of overcrowded slums, rife with crime and disease. Indeed, it's hardly an overstatement to say that the endless flood of people is on the verge of turning Gaborone into an unsustainable nightmare. In the West, demographics have become a heated topic of discussion lately, although mostly in the context of Mexican immigration to the United States, or fears about the Muslim birthrate in Europe. But to read through the State of World Population 2007, a report released last week by the U.N. Population Fund (UNFPA), it's easy to think that the more significant trend by far is the breathtaking rate at which poorer countries in the developing world are urbanizing--and doing so at a pace that dwarfs anything Europe experienced at the peak of industrialization. A few numbers get the point across: By 2030, nearly 5 billion people around the world are projected to live in urban areas, up from 3 billion today. Up to 2 billion of those will be crowded into slums--huddled in tents and surrounded by overflowing pit latrines, or in tin shacks crammed on jagged hillsides. In Asia and Africa, the urban population will double in the next 25 years. It's true that Europe went through a similar shift during and after the Industrial Revolution, but that was over a much longer timeframe, and the ensuing waves of emigration to North America helped alleviate the burden on European cities--an option that no longer exists. The sheer scale of the current population shift is, in every sense, unprecedented. Strikingly, most of the growth will occur not in the much-hyped "mega-cities" like Shanghai or Lagos, but in small- and medium-sized cities like Gaborone, which are even less well-equipped to deal with the boom. (In fact, many mega-cities, like Sao Paolo and Calcutta, are actually shrinking, as people leave for less-crowded areas.) Moreover, many cities in the developing world aren't sprawling neatly into suburbs, as in the United States and Europe. The process is often much messier, as urbanization crops up further into the countryside--in the corridors between cities in China, for instance--making these new boom towns more difficult to regulate and serve (to say nothing of the ecological impact). The UNFPA report puts a relatively optimistic gloss on the potential consequences of this shift, all things considered. Yes, urban poverty and squalor will expand, but even slum-dwellers are happier and better off than rural subsistence farmers. Yes, crime and violence will increase in the cities, but women will have better educational opportunities. Yes, AIDS can thrive more easily in urban settings, but so can treatment and prevention programs. The clear message of the report is that outcomes all depend on proper governance--that nothing is insurmountable with the right policies. The main hurdle, UNFPA insists over and over, is simply that too many governments are in denial, trying to control urbanization by evicting people or denying them services--strategies that always fail. Is that right? It's true that denial and cruelty are rampant: In Nairobi, the 200 or so "informal settlements," where 60 percent of the population lives, are utterly ignored by city officials. In places like Karachi, slum-dwellers are left to the mercy of local political machines, which demand exorbitant rents and threaten to evict those who don't pay. But finding the right policies isn't just a question of will and good intentions. Take Gaborone. It's one of the least corrupt cities in Africa, and has made ample effort to plan sensibly for the burgeoning new settlements--renting out fully serviced plots of land and regulating sales to prevent speculation. But while that has worked for low- and middle-income families, the very poor are still streaming into makeshift slums, lacking clean water and sanitation. Perhaps the clearest point in the UNFPA report is also one of the most obvious--family planning matters a great deal. Most of the new urbanization isn't going to come from people moving off the farms, but from increases in the natural birthrate. Roughly one-fifth of all married women in the developing world lack access to family-planning services or modern contraception, and care is often spotty for others. Simply meeting these needs--and, yes, that would include safe abortion providers--would prevent tens of millions of unintended pregnancies each year. There's not a whole lot in the UNFPA report that translates easily into recommendations for policymakers here in the United States, but in this context, the Bush administration's well-known hostility toward family-planning efforts overseas becomes particularly glaring. Notably, the report also offers a more upbeat take on the sociology of the coming slum explosion than Mike Davis does in his dystopian book, Planet of Slums (which, admittedly, is about as bleak a view as it gets). Davis hints darkly that the growing slums will be wracked by communal violence, and that angry slum-dwellers may well turn to populist leaders along the lines of Hugo Chávez and Alberto Fujimori--both of whom rose to power with support from the neglected ranks of the urban poor--or even fascist groups like Shiv Sena in Mumbai. UNFPA, for its part, holds out hope for a more benign future, in which the urban poor organize and create community groups such as ZOTO in Manila, which has pushed for laws against forced evictions. And whereas Davis argues that radical strains of Islam and Pentecostalism will catch on among the urban poor--creating a large constituency around the world that explicitly rejects Western civilization--the UNFPA is more sanguine, suggesting that, while urban areas are likely to be breeding grounds for mass religion, the slums probably won't turn to fundamentalism in overwhelming numbers. It's probably impossible to say which one is right: Trying to predict the behavior of 2 billion new urban inhabitants is bound to be dicey. At this point, all anyone seems to agree on is that the population shift--and its consequences--will be massive.